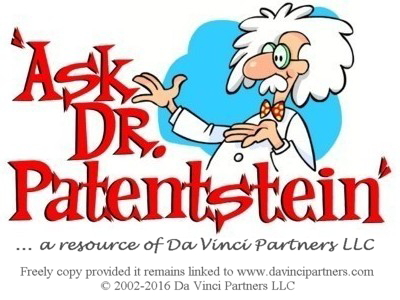 Add the "Ask Dr. Patentstein" service to your own Web site and offer visitors direct access to the advice of qualified Patent Attorneys. Select from either our regular or large graphic options below, insert the HTML into your Web page and let us do the rest. Note: you understand that by your mere use of this service, you do not become a client of Dr. Patentstein, Da Vinci Partners LLC or any of the attorneys or agents in our network.